NEW YORK—Ms. 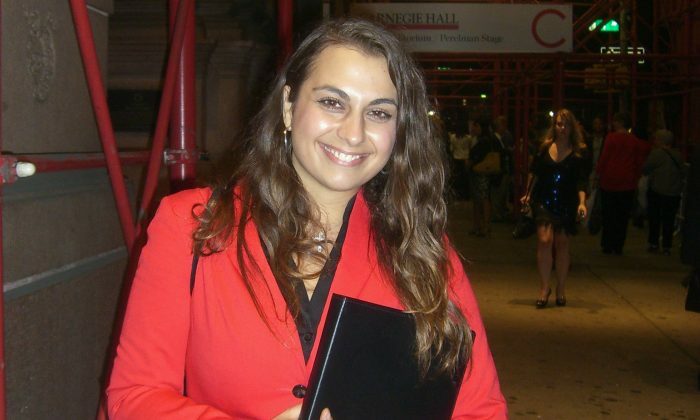 Sofia Antonakos, an opera singer, had a memorable experience at the Shen Yun Symphony Orchestra at Carnegie Hall on Oct. 5. The orchestra presents pieces from its own repertoire of original compositions, as well as a number of masterpieces from the Western classical tradition. Ms. Antonakos, a native of Greece, said the dynamic of the orchestra was beautiful. The singer has been training in New York City since August 2012 under Mark Oswald, opera coach of the Metropolitan Opera House. “Everyone had standing ovations, and I looked around, and people were almost in tears—and they were all very, very happy,” she said. Ms. Antonakos said the overall performance sounded like it was about the beauty of art, and about nature, and that the performers were trying to express that beauty through culture. “I could tell that it was very rich in culture, very rich in the Asian feel, and that was my favorite part. But when it went more modern, it was more American,” she said. The New York-based Shen Yun Symphony Orchestra is part of internationally-acclaimed Shen Yun Performing Arts, which features Classical Chinese dance accompanied by orchestral music. Ms. Antonakos said that she could imagine the dancers of Shen Yun Performing Arts dancing to the music. “Shen Yun’s all-original works combine Chinese and Western instruments and draw upon the rich culture of China’s 5,000 years,” the orchestra’s website states. Ms. Antonakos said that she had never heard rhythms such as those produced by the Shen Yun Symphony Orchestra. Each of the four maestros had his own variety of sounds, his own rhythms, and his own interpretation of the music. “It was very pristine,” she said. James Griffin, a classical music radio broadcaster from Australia, organizes international music tours for people in his region who appreciate music.